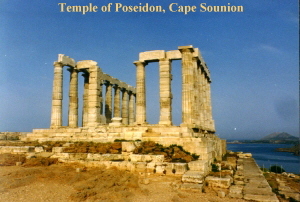 The harbor at Cape Sounion is well known for its famous Temple of Poseidon, which overlooks the Aegean Sea to the south. The bay below the temple has a mud/sand bottom, providing good hold for our plow anchor. 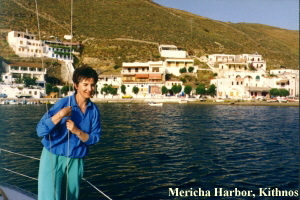 In the fall of 1988, we began planning a sailing trip to Greece. “We” includes our friends Jeff and Glenna, who got married the week before departure, and Sandy and myself, who are longtime sailing companions. With keen anticipation, we scurried off to our local library to read articles on sailing in Greece. Unfortunately, we could find nothing about chartering a small sailboat in Greece. Somewhat discouraged by this lack of information, I decided that when we returned, I’d write an article that might be useful to anyone else considering a similar venture. We returned; here’s the article. In Greece, there are two bareboat options — going with a flotilla or going alone. A “flotilla” is 8 to 12 boats under the guidance of a lead yacht. For someone with limited sailing experience, a flotilla is the way to go. The lead yacht has a captain, hostess and mechanic who provide information and assistance with everything from route planning to anchoring. They even tell you where the rocks are and which restaurants serve the best kalamari (squid). For the most part, except for a few “free sailing” days, the boats remain in close proximity with prearranged destinations. What really tipped the scale in favor of an individual charter over a flotilla was the sailing area available to us. In Greece, there is a group of islands in the Aegean Sea, between the mainland and Crete, called the “Cyclades.” Friends who had vacationed on these various islands had nothing but good stuff to report. It seemed no one had spent much time visiting other areas — the Ionions, Sporades, and Saronics, all of which offer flotilla sailing. We wanted to see the Cyclades, and to do so meant we had to go on our own. Perfect! We booked through a U.S. based Charter Company, Valef Yachts, in February for 10 days in May. 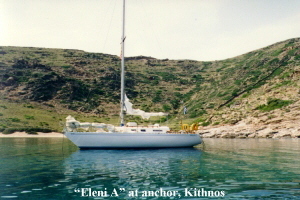 They provided a 33′ Carter (the Eleni A ) which is a comfortable-sized boat for four people. The only exception is the cramped quarterberth — if two people sleep there, they have to turn over in unison. The boat rented for $2400 (Canadian) with a 50% deposit required on the date of booking. Once paid, we received a charter agreement, an equipment list and a “menu” allowing us to pre-order our food and beverages. We only ordered beverages — wine, beer, soft drinks and bottled water — since we planned on eating most of our meals in restaurants along the way. The charter agreement required at least two people to have sailing certificates although it did not stipulate the level of those certificates. Both Jeff and Glenna had completed an intermediate Canadian Yachting Association course, including a week’s sail with an instructor. Sandy had an introductory CYA Sailing Certificate, and I had completed various courses including Advanced Piloting through the Canadian Power and Sail Squadrons. A résumé of the captain’s sailing experience was also required. The Charter Company suggested we do some pre-reading in a book entitled Greek Waters Pilot. Unfortunately, we were unable to locate a copy in our library or local bookstores. As it turned out, this book was on board our boat and proved most useful as a guide to the islands. It not only included information on the ancient history of each island, but also details on approaches, mooring areas, facilities, and depths of harbors and channels. It even included some photographs similar to Sailing Directions in Canada. The edition we had on board was 1982, but a later edition (1987) has been published. If you’re planning a sail in Greece, I would recommend late May or early June, primarily because of the weather and the crowds. In July and August, the average temperature is “hot” (33º C.) and the wind, known as a “meltemi”, blows from the north up to 30 knots, creating a very choppy sea. Going south on a run would be great, but beating back at the end of a holiday could be arduous. Also, most tourists, both Europeans and North Americans, travel to Greece in the very busy summer months. Getting to Greece from Canada can be expensive if you fly direct to Athens. We saved $500 by flying to London; then to Athens. We arrived in Athens at 2300 which was 1400 (9 hours earlier) in Edmonton. Ever try to sleep in a strange bed in a strange country when you’re all excited about going sailing and your body tells you it’s the middle of the afternoon? It didn’t help at all to have a horde of motorbikes racing up and down the street outside our hotel! We had planned to spend a couple of days in Athens before picking up our boat. This would allow us to partially recover from jet lag and also give us a chance to do some sightseeing and shopping for our trip. Based on recommendations of friends who had stayed there, we had made reservations at Tony’s pension. Tony speaks very good English, is an avid sailor, and his reasonably priced hotel is within easy walking distance of both the Acropolis and the Plaka (a major shopping and entertainment area). We were fortunate in being there on a Friday, the one day of the week when the locals bring their produce to market, just a block from Tony’s. We had read about scurvy at sea so we made sure to stock up on fresh fruit (and Ouzo, which we knew was a major source of vitamin C!). Although we had taken advantage of the duty-free shop at the airport to purchase liquid refreshments, we discovered that prices were considerably lower in Greek liquor stores. 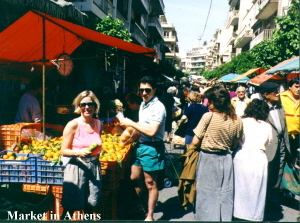 Early Saturday morning, we packed up our groceries and headed for Kalamaki Marina in Piraeus, a 15-minute taxi ride. The owner met us at the boat, gave us an orientation, took our $900 U.S. Money Order as damage deposit, and wished us “Bon Voyage.” Within two hours, we were close hauled, heading south to Cape Sounion, which is still on the mainland but a good “jumping off” point to reach the islands the next day. The harbour at Cape Sounion has just one hotel and a taverna on the beach. Since most of the other boaters were at the taverna, we decided to go there as well — a bad choice! Most of our meal went to the slightly overweight dog, which wandered among the tables looking for handouts. Fortunately, we had brought along a large jar of peanut butter; so off we went for a late night snack! The next morning, we got up early and climbed the hill to the temple, built in 444 B.C. Fifteen Doric columns remain standing on a rocky bluff overlooking the sea, an appropriate setting for “God of the Seas.” Under way again, the wind picked up from the south, our direction of travel. We eventually tacked our way to a pretty little cove immediately north of our destination on the west coast of Kithnos. Dropping the hook in 10 feet of crystal-clear water, we had our first swim in the Mediterranean. The water itself was the bluest I have ever seen, but the marine life, probably because of the absence of tidal zones, was not as abundant as you’ll find off Vancouver Island. Oh well, life’s a tradeoff — blue and warm water for crabs and starfish! After a little sunning on the beach, we motored around the point and anchored for the night in Mericha Harbor. It was here where we had one of our best Greek salads of the trip – at an outdoor taverna overlooking the harbor. We watched the sunset while sipping Retsina, a Greek table wine flavored with resin (pinesap). This is not the wine you would order to impress your friends, unless they happen to be woodpeckers with an affinity for pine trees! It has a very bitter taste, which requires some getting used to, but one thing you can say about it: a bottle lasts a long time! We found out later that you can order this wine without the resin, which is much more palatable. Before dinner, we also had a chance to shower, for $2.00 each, which was the going rate at most hotels. Showers in Greece are not like showers back home. Most noticeably, they are open to the rest of the bathroom, which invariably leads to soggy toilet paper! On our third day, we got underway early, again heading south into a brisk southerly. As we sailed between two islands, the wind blew erratically from different directions, presumably due to land effects. At one point, the wind actually felt hot and strong providing us with a sample of the meltemi (literally “hot wind”). After motoring through a few calm spots, the wind again picked up, allowing one long tack to Vathi Harbor on the island of Sifnos. Again we anchored — this time with a half-dozen other boats from various countries. During our entire trip, we only encountered two other boats flying Canadian courtesy flags. Most boats came from Germany, England, Holland or France. It’s quite entertaining to be in a small cafe with six tables of sailors, all speaking a different language! It was here that some Swiss sailors suggested our plan to go to Santorini (about 10 hours away in a good blow) was a bit ambitious. 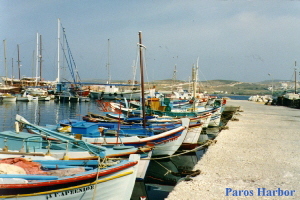 They suggested Paros as an alternative, which was only half the distance. After scanning our charts and appraising our progress, we agreed that we were spending too much time on the boat and not enough on land, exploring the islands. OK then, we would spend two days on Paros, putting us halfway through our trip. The next morning we got underway by 0700, to reach Paros by early afternoon. While planning the trip, I had been concerned about the possibility of being out of sight of land while travelling between islands. Not to worry — the visibility of 8 to 10 miles in haze was sufficient to get us started in the right direction. If we couldn’t see our destination, which was more often than not, we obtained a “Fix” off the island we were leaving and from there, plotted a course to our destination. In Greece, navigation is simplified because there are virtually no tides, and current is negligible. Also, “variation” between Magnetic and True courses (about 2º East) can be ignored for practical purposes. As we docked in Paros, we were greeted by “Christopher,” a charter sailor from England, whose boat was tied off directly behind us. Having been there for over three weeks, his help was invaluable. We found out about showers, tavernas, restaurants and tons of stuff about islands he had visited. In nearly every port, we encountered sailors who were eager to share their experiences. A chap from Australia, who had wintered in Paros, said he counted 23 gale-force storms during his stay, the most recent one occurring in early May just three weeks before our arrival. We were very fortunate in that regard — the weather was sunny and warm (about 25º C) almost every day with a steady 10-to-20 knot breeze blowing for several hours at least part of every day. There seemed to be no consistent daily pattern to the winds. Some days, they would blow in the morning, even before we were underway; other days, they would freshen in the afternoon. By evening, winds were generally calm, allowing for restful sleeps. To explore the island, we rented a couple of motorbikes. On the far-east side, we watched several wind-surfers reaching and jibing in a beautiful little bay off Golden Beach. Wetsuits and funboards were in abundance, although rental boards would not be available until the tourist season, starting around June 1st. We visited a picturesque little fishing village (Naoussa) in the northeast corner of the island where we squeamishly watched a fisherman beating an octopus against the rocks to tenderize the meat. We also stopped inland at a quaint little village (Lefkes) for lunch. Most of the buildings in this village were made of pure white marble from a nearby quarry, which supplied marble for Venus De Milo and for Napoleon’s tomb. By the fifth day of our trip, our contract required us to be at the furthermost point in our cruise and we were, 95 miles from Piraeus. 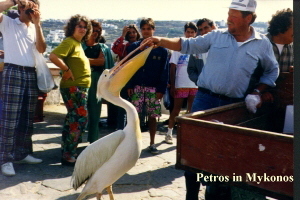 Our next stop would be Mykonos, another popular tourist destination 25 miles northeast. Christopher had advised us to get there early, at least by 1400, if we wanted a spot at the dock. We cast off at dawn, turning north into a light breeze blowing directly from Mykonos! We zigged and zagged until our speed dropped below 2 knots; then motored. About noon, we began to make out an island in the haze and the wind had freshened to 20 knots, providing us an exciting beam reach to the harbor, a nice way to end the day. In Paros, we had docked in the Canadian fashion, parallel to the dock. 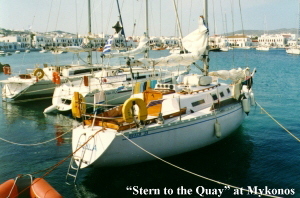 However, the typical method of docking in Greece is “stern to the quay:” you drop anchor about four or five boat lengths out and back in. Since it’s helpful to have someone on the quay to throw a stern line, Jeff got off before we anchored. We also considered it prudent to firmly “set” our anchor before reaching the quay to ensure it would hold should the wind pick up. Finally, we used spring lines tied forward to hold us straight ahead. Mykonos is a very romantic place with narrow streets, whitewashed buildings, windmills overlooking a peaceful bay, and colorful fishing boats bobbing at anchor. Several bars provide spectacular views of the sunset and play classical music to sooth the savage sailors. The next morning, as we sipped Greek coffees at one of the outdoor cafes that ring the harbor, we observed an old man resting on a bench in front of a church; an old woman leading a donkey with baskets of fresh-cut flowers; a priest in flowing robes; a fisherman, complete with weathered face and cap, mending his nets, and a friendly pink pelican (“Petros”) who strolls through the marketplace as the mascot of Mykonos. We kept waiting for Zorba to dance on the rooftops! At this point in our journey, we had a choice of destinations — Syros or Tinos — each about equal distance along our return route. We reviewed pictures and descriptions of the two ports in a book we had purchased – The Greek Islands – which proved to be a handy reference for things to see and do on each island. We opted for Syros after reading this excerpt: “As one sails into the island’s harbor, Hermoupolis, the view of the town is truly splendid, with its impressive mansions.” It’s true: buildings extend from the quayside a half mile upward to the top of the hill. Very impressive! Unfortunately, the book forgot to mention the odors that are created when sewage from all those buildings arrives in the harbor. There would be no swimming off the boat tonight! While the harbor itself was not what we had expected, our early evening walk up the hill through the streets and alleys more than made up for it, broadening our perspective of Greek life away from the tourist scene. A group of young boys were playing basketball without a net; small girls saying “Hello – Goodbye” in a friendly attempt to practice their English; a grandmother — sweeping out her house — who allowed us to take her picture but only after she removed her scarf; two boys who encouraged us to play “soccer” on a crude miniature table game; and an old man who, as custodian, unlocked a Greek Orthodox Church, encouraging us to have a look inside. Our personal safety was never at risk — everyone we met was friendly and attentive to our feeble attempts at communicating. We felt honored to be able to experience this aspect of life in Greece, which very few tourists get to see. Only five yachts were at the quay and we never met their occupants on our excursion into the hills. At 1900, we topped up our fuel tanks by walking to the local gas station and arranging for the fuel truck to come to the quay. Diesel fuel, at 45 cents a liter, is usually delivered to the quay around 0900 and 1600, but can be obtained at other times for a small fee. The next day, we set course for the east coast of Kithnos. We had been on the west side of this island earlier in our trip and had heard about the medicinal springs at Loutra, the waters of which are presumably beneficial for all sorts of ailments, including hangovers! Again, the wind was favorable, pushing us along at 7 knots under a full genoa and main. This 4-hour sail, on a blue-sky day, was more therapeutic than any spring could ever be! 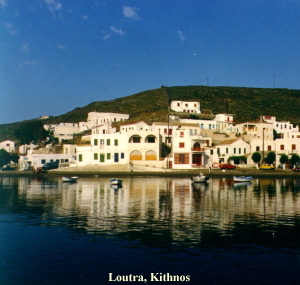 Loutra is another of those quiet little villages with one taverna and several small shops. A new hotel was just being built adjacent to the hot springs and should prove to be a popular tourist attraction. On our visit, the fishing boats numbered 12, the yachts five, all at the quay. In our attempt to back in, we were pushed sideways by a strong crosswind, requiring us to go forward several times. Little did we know that in doing so, we were wrapping our anchor chain around the flukes of a large Queen-Mary-type anchor. Fortunately, the next morning the water was dead calm, allowing us to observe and unravel the chain by maneuvering our boat in the appropriate directions. We found out later that this large anchor belonged to a freighter that had gone aground in a storm just outside the harbor. It remains there today as a reminder that “the sea hath no mercy” and as extra ground tackle for unsuspecting yachties! Anchor up and motor out! And motor we did. The wind was too light to give us more than 2 knots and we had a 40-mile passage ahead in order to get to the island of Egina for our last night out. This plan would put us within 4 hours of our homeport for an easy sail the last day. Finally, the wind picked up enough to allow us a brief sail to our destination, Agina Marina — a scenic little bay in the north-east corner of the island. Most boaters who visit Egina use a more sheltered and crowded harbor on the northwest corner; however, we wanted a quiet anchorage on our last night out. Following a swim (the only harbor where we did so), we rowed ashore, showered, and had dinner at a cafe overlooking the bay. After dinner, we strolled along the main street, which has a more western flavor than the towns in the Cyclades: a horse drawn carriage, rock-and-roll music, a wagon-wheel fence, and numerous ice cream shops. This island is part of the Saronics Group and is very popular with Europeans, being only a short hydrofoil ride from Piraeus. The next day, our last sailing day, we awoke to a strong offshore breeze. 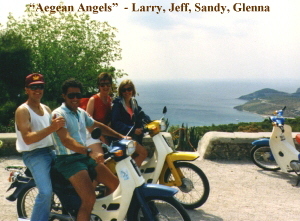 Although eager to sail, we had decided to rent motorbikes and visit the Temple of Aphaia, just a few miles from town. These miles are all uphill providing great views of the harbor, which Sandy refused to look at unless the motorbike was completely stopped! Today, all that remains of the ancient temple are some 20 columns and a few foundations of buildings long since decayed. We took our mandatory pictures and left, hoping to get underway while the wind was up. We weighed anchor early afternoon and motored into a calm sea. After a couple of windless hours, we decided to bag the genoa. No sooner was the bag below than a storm approached from Athens with lightning, rain, and wind, lots of wind! Why is it that “lots of wind” on a sunny day is what sailors crave; the same wind on a stormy day is scary? Too scary to put on the working jib and reef the main? Yes, the majority (3 to 1) ruled we motor with the rationale that we would get there sooner and have more time to clean the boat. Now that’s something to look forward to on my holiday! Besides, as Sandy pointed out, “there are no other sailboats in sight.” This is Sandy’s big stick — there must be a reason why no other boats are out. As the wind whistled through the rigging at 25 knots, I could think of no good reason … but we motored anyway! We arrived at the marina a couple of hours early, giving us time to scrub down the boat (in the only rain of the trip), pack our gear, and have a final congratulatory drink! The owner arrived soon after, checked over the boat, returned our damage deposit (minus $8 for a broken head plunger — a small price to pay! ), and bade us farewell as we headed back to Tony’s pension for one last fling in Athens. We flew to London the next day. From there, Jeff and Glenna visited Portugal to continue their honeymoon while Sandy and I motored up to Scotland (on the wrong side of the road!). But that’s another story…!